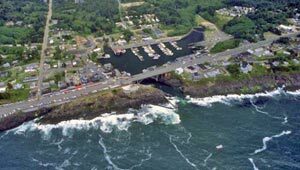 In 1996, the city of Depoe Bay received a grant from the Oregon Department of Land Conservation and Development for a 10-year coastal landscape visioning process to help preserve the area's natural landscape and the community's unique character in the midst of increasing development. Its greenprint for conservation targeted ten contiguous parcels of oceanfront land for public acquisition. Preserving the lots between the ocean and Highway 101 would protect their magnificent view of the Pacific Ocean and its shoreline while maintaining the essence of the community. With support from the State Parks' local government share program and Federal Highway's Transportation Enhancement funds, TPL conveyed three of the parcels to the city of Depoe Bay at the end of 2001 for use as a municipal waterfront park. These sites and the existing public ocean frontage they adjoin are now a park that features unparalleled views of the ocean. This spectacular seaside vista was the backdrop for a scene in the Jack Nicholson movie One Flew Over the Cuckoo's Nest.